In this paper we present a fully integrated solution for broadband multi-stream reception, based on the direct sampling receiver architecture. The key enabler of such a solution is a 64-times interleaved 2.6 GS/s 10 b Successive-Approximation-Register ADC. The ADC combines interleaving hierarchy with an open-loop buffer array operated in feedforward-sampling and feedback-SAR mode. It is used in a fully integrated direct sampling receiver for DOCSIS 3.0 including a digital multi-channel selection filter and a PLL. 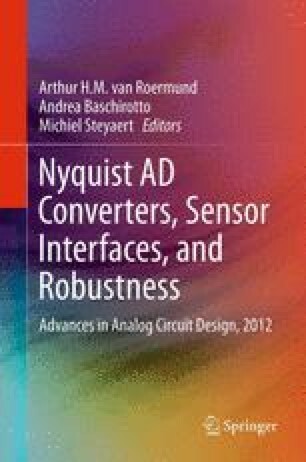 The ADC achieves an SNDR of 48.5 dB and a THD of less than − 58 dB at Nyquist with an input signal of 1.4Vpp − diff. It consumes 480 mW from 1.2/1.3/1.6 V supplies and occupies an area of 5.1 mm2 in 65 nm CMOS.